In some ways, Te'Shan Campbell is Ohio State's "other" senior starter. Team captains Myles Martin, Micah Jordan and Joey McKenna get most of the attention from fans and reporters, and understandably so: they're each legitimate NCAA Championship contenders. Campbell, a four-time NCAA qualifier and former ACC Champion, has yet to truly distinguish himself as a Buckeye. To the casual fan it appears that he has all the tools: he is a hammer on top, one of the strongest men on the team and has the chiseled physique of a true gladiator. And yet entering the Round of 16 in his fourth and final NCAA tournament, Campbell is still searching for that signature accomplishment as a Buckeye. His career record of 80-35 is solid but uninspiring; his patented "Te'Shan Tilt" is lethal, but he goes lengthy stretches without taking a shot. But he knows he can make the podium in Pittsburgh. "Staying confident, believing in myself," he said when asked what it would take to finish as an All-America placer. "Trust in the process, because it's easy to slip. I was hurt at the beginning of the season, struggled with weight ... competing all year at a different weight class and then cutting down so, really not letting my emotions get the best of me." At the end of the day, he said his final tournament was all about keeping things in perspective. "I'm here, so [I'll] be thankful and take advantage of the opportunity." Campbell was born and raised in Pittsburgh, so wrestling his final college tournament in front of a hometown crowd is special. The Penn Hills High alumnus was a two-sport star, winning the 2015 PIAA state champion at 170 pounds, capping off an undefeated senior season while also a running back for the Indians. He spent his first two years as a college wrestler competing for the Pitt Panthers, earning an overall record of 40-16, including a 22-4 mark in 2016-17 en route to the 2017 ACC title. That focus on personal growth is a hallmark of the Buckeye wrestling program, but improvement on the mat was part of the picture as well. “I got better at wrestling throughout the way,” Campbell told Adamski, “and I challenged myself. I put myself in positions to better myself, and that’s probably the biggest thing. I just grew as a man." Campbell's season saw him starting the year at 174 pounds, up a class from the previous year. Buckeye head coach Tom Ryan said more than once that Campbell had one of the toughest cuts on the team last season, and the idea was for him to take advantage of his size at 174. Redshirt freshman Ethan Smith had designs on that starting spot, too. With Smith turning heads and showing up in the national rankings as the two men split duty, Campbell did what was best for the team: dropping back down to 165 as it became clear that Kaleb Romero wasn't ready for primetime at that weight. The senior entered the tournament with a season record of 20-7, 12-5 of which came at 165. His overall record isn't too shabby, but Campbell also holds a disappointing 0-6 record against ranked opponents across both weight classes. Ohio State didn't get the points out of him they needed last year at the NCAA Championships in Cleveland, but his first three probable matches this year present a winnable if challenging slate. 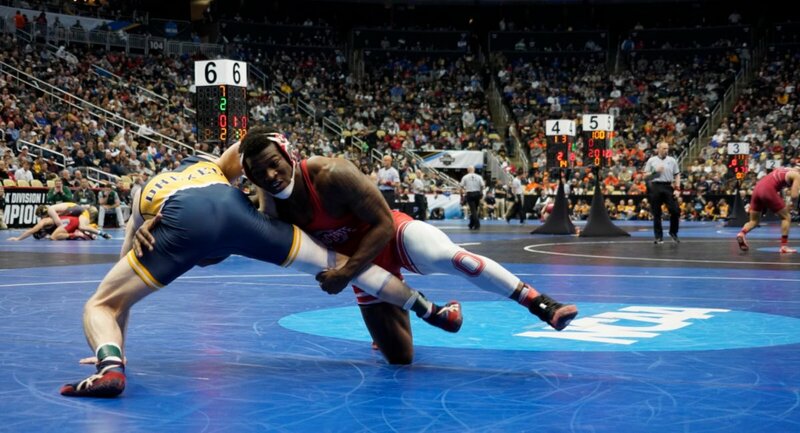 He opened versus 12-seed Ebed Jarrell of Drexel, and wrestled a dominant third period to advance to the Round of 16. After Jarrell rode him for the entire second period, Campbell took the shot he needed to take in the third, and hit that "Te'Shan Tilt" for a 4-point near fall and the 6-0 decision. Thursday night he'll see No. 5 Chance Marsteller of Lock Haven, who defeated Minnesota's Carson Brolsma in a 16-3 major decision in Session I. If Campbell can get past Marsteller, he'll have Evan Wick of Wisconsin, the No. 4 seed. If he can make it to that quarterfinal match and then pick up a win or two in the consolation bracket, it would be a boon for the Buckeyes and a respectable coda to Campbell's career. 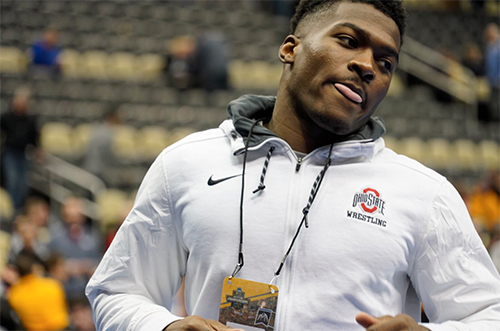 Under the bright lights in PPG Paints Arena, he'll put it all on the line for Ohio State – and for Pittsburgh.